In proud partnership with the Hunter S. Thompson Estate, Top Shelf Productions is pleased to present Fear and Loathing in Las Vegas, a delightfully bonkers graphic novel by Eisner-nominated artist Troy Little adapting Thompson's seminal book of the same name. Join Thompson's alter ego Raoul Duke on the mother of all Vegas benders, as he and his attorney Dr. Gonzo cover a motorcycle race, crash a drug-enforcement convention, and rack up obscenely large room-service bills, all while dosed to the gills on a truly spectacular assortment of mind-altering substances. 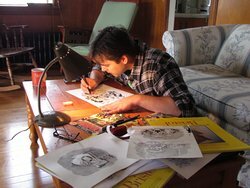 TROY LITTLE - Two time Eisner nominee and Xeric recipient, Troy began a career in animation after graduating from the Interpretive Illustration course at Sheridan College in Ontario, Canada. In 2000 he began self-publishing his comic series Chiaroscuro which garnered him both a Xeric and PEICA grant and was eventually collected by IDW Publishing and published in 2007. His second book, Angora Napkin was published in 2009 with IDW and was nominated for the prestigious Eisner Award (Best Publications for Teens) in 2010. Angora Napkin was also developed as an animated pilot for Teletoon, Canada and was broadcast Halloween night in 2010. Angora Napkin: The Golden McGuffin, the weekly web serial was launched in 2012. Angora Napkin: Harvest of Revenge was published by IDW in 2013 and nominated for an Eisner as well (Best Lettering). In 2013 Troy took on The Powerpuff Girls re-launch as series writer/artist/colourist. 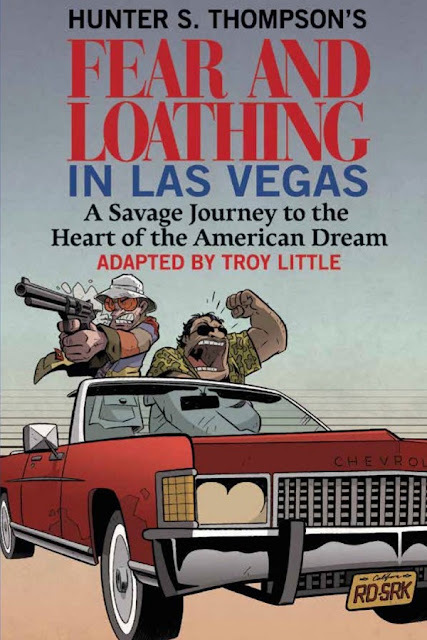 In 2014 he began adapting Hunter S. Thompson's cult classic novel "Fear & Loathing in Las Vegas" for IDW / Top Shelf. I love the original story of Fear and Loathing by Hunter S. Thompson. Also loved the film that starred, Johnny Depp. Now I have another story to love! The illustrations bring to life the one-of-a-kind character, Raoul Duke and his dodgy lawyer, Dr. Gonzo. These two are on a drug-fueled adventure of epic proportions through Las Vegas. Between the drugs and paranoia, you get a mish-mash of things going on, and yet the all make sense and work. This is definitely one of those stories that you will either love or hate. I guess it depends on if you are a fan of these kind of stories, and I don't mean graphic novels, I mean the content. I like those topics in stories, so it was a great read for me. Highly reminiscent of what I already know to be the story, but with more drugs and misadventures. If you're a Hunter S. Thompson fan, check it out. I think Troy did a great job of adding to these characters.